While we say goodbye, he says hello. Our work is over, but Remi Garde's is only just beginning. If the new Aston Villa manager didn't realise he had a massive task on his hands, then he does now. Make sure you're back with us tomorrow as Manchester goes continental. Both United and City are back in Champions League action. Au revoir! Defeat leaves Aston Villa with just four points from their opening 11 matches, meaning they are four points adrift of safety. More from Aston Villa caretaker manager Kevin MacDonald: "When you're bottom of the league there's always a lack of belief and confidence, particularly with young players. But they have to toughen up. Their performance in the last 20 minutes will have given them a little bit more belief. Won five, drawn five, lost one. That's the "good" start by Spurs which Mauricio Pochettino refers to. And this is how it leaves the business end of the Premier League. Tottenham manager Mauricio Pochettino, speaking to Sky Sports: "In football you must never lose your focus and maybe we lost our position on the pitch late on because our mentality was to go forward. Today we showed some good quality. We suffered a little bit in the last 10 minutes but that's football." On Dele Alli: "We need to provide him with the tools to improve his game. He is still young and I always say young players need to keep their feet on the ground. Thiis is very important. When you have quality like he does you have to push him and try to improve his game. I'm very pleased with him." On Tottenham's 10-game unbeaten league run: "It's not important. The next game is important and we need to keep our focus and win the next game. Our start is good but that's nothing." Aston Villa caretaker manager Kevin MacDonald: "For the new manager, the shift the players put in shows that there is something for the manager to work with. "Remi just left it to ourselves tonight. I'll tell him he's got something to work with and there's a great desire to work with. "The players need to keep the ball better and I'm sure Remi will be reiterating that to them as well with his Arsenal background." On returning to his job as youth-team manager in the morning: "I'll get home at probably around 1am tonight and then I'll be back in at 7 or 8am to work with the younger lads." Villa club captain Gabby Agbonlahor suffered a miserable night, barely having a kick in the first half before being hooked at the break. But the forward was brought off as a precaution after suffering a calf injury, caretaker boss Kevin MacDonald tells us. Aston Villa caretaker manager Kevin MacDonald: "We came with a game plan but that went out of the window after two minutes. In the second half we created more chances, got a little bit of luck and were fighting, fighting, fighting. But Tottenham have very good players and if you give them a chance they'll score. "I went with a team I thought could cause problems for Tottenham. It was the best Aston Villa side I thought could start." Tottenham defender Jan Vertonghen, asked by Sky Sports if Spurs can finish in the top four: "We try the same thing we do every year. In previous seasons we dropped points at home. Last year we would have lost this one I think but we have a very good team mentalitry-wise and we keep pushing each other." Tottenham teenager Dele Alli on scoring his first goal at White Hart Lane: "It definitely means a lot. The fans have been great, and the players and staff have helped me settle in. So this is for them. "I've still got a lot to learn and Jan (Vertonghen) is usually one of the first to tell me where I need to improve! It is great to have leaders like that around. It has made it easier to come here and show what I can do." Spurs defender Jan Vertonghen on teenage team-mate Dele Alli: "To be honest before he came here I didn't know him! I don't know anything about the lower leagues. And I don't mean that in a bad way! He has impressed everyone since he has arrived. He has been unbelievable." The Football Social is under way on BBC Radio 5 live. Get in touch on 0500 909693 as Danny Mills and Conor McNamara join Mark Chapman to discuss tonight's match and assess whether Villa look like a side capable of staying in the Premier League. Tottenham goalscorer Harry Kane: "We've got a great squad and some great young players. It's great for Tottenham and great for the country. It's about maintaining that and we need to push on." Asked if he ever doubted himself during a barren run at the start of the season: "I don't think you can doubt yourself at this level. You have to stay confident and wait for your chances and that's what I've done. I had to wait until stoppage time tonight but you have to be patient." Spurs centre-back Jan Vertonghen on Sky Sports: "It was nervy in the end but we were very solid before that - they tried hard to score that equaliser. It's a shame that we didn't manage to keep the clean sheet but it was a good win." Here's why Spurs deserved their win. They dominated possession and territory, plus had 17 attempts at the Villa goal. All over! Spurs made hard work of it, but in the end are celebrating a well-deserved win. Spurs go 10 matches unbeaten in the Premier League to move above West Ham into fifth. Villa are rock bottom after their seventh straight defeats. A lot of fat for Remi Garde to chew over. Game, set and match. Tottenham seal victory through a man who is back in the groove. An unmarked Harry Kane screams for the ball at the far side of the Villa box, coolly being picked out by Erik Lamela. And the England man smashes into the top corner. Huge sigh of relief from the majority inside White Hart Lane. Tom Holmes: If Villa can grab something out of this game it'll be pretty much the definition of a smash and grab. NathB: Remember when Villa played outrageous counter attacking football? Whatever happened to that? Now Spurs go for the oldest time-wasting trick in the book - a late substitution. Dele Alli is the man replaced, with another youngster Josh Onomah coming on for his Premier League debut. Tottenham look to take the sting out of Villa with a much-needed spell of possession in the away half. 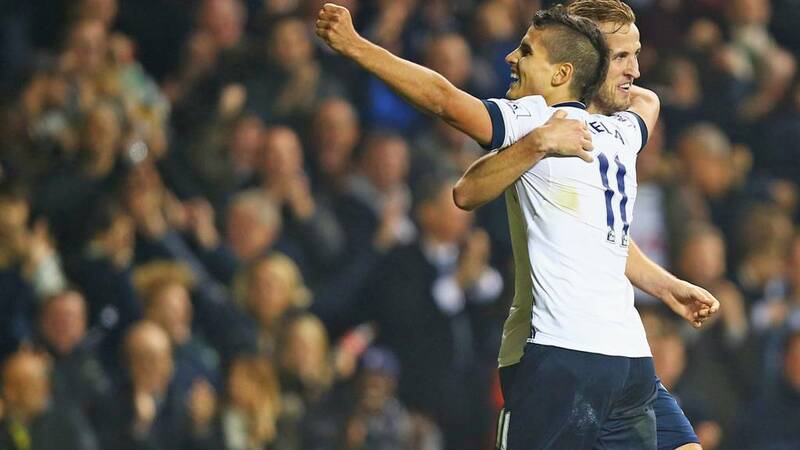 Erik Lamela slows the tempo right down, teases the Villa defence and forces a home corner. "Remi Garde has the best poker face on the planet. If Aston Villa get back in this it could turn around their whole season." Who saw this coming? Not me. Villa go close again. Jordan Ayew belting a dipping shot inches over the Spurs crossbar. Now it is the away end - behind the goal which Villa are attacking - which is making all the noise. Almost an equaliser! A high ball is slung towards new Spurs arrival Ben Davies, who sees the shadow of Villa striker Rudy Gestede looming over him. Davies is not trusted to deal with the high ball by keeper Hugo Lloris who charges out of his goal. The Frenchman misses the ball, but is relieved to see Gestede's header drop the wrong side of the post. Aston Villa have had nine shots in the second half, three times as many as the first. Her's how Jordan Ayew's strike went in, though this doesn't show the deflection that took the ball past Hugo Lloris. Villa fancy this now! Tottenham momentarily down to 10 men as Danny Rose receives some treatment. Can Villa take advantage? Here we go! The Villa comeback is on. Spurs pay the price for losing concentration. Ryan Mason gives away possession inside his own half, allowing Jordan Ayew to drive forward before launching a low shot goalwards from distance. The ball flies past Hugo Lloris into the bottom left corner, with the aid of a deflection off Jan Vertonghen. Game on! Almost a lifeline for Aston Villa! Leandro Bacuna smashes the post with a curling effort from outside the Spurs box. Hope for the visitors? Aston Villa - not enough ambition or can they simply just not get out? They are finding themselves in much deeper positions on average than their Tottenham counterparts, as the graphic below highlights. "That's the difference between the Championship and the Premier League. Rudy Gested just hesitated for those two chances, but you don't get that time, the defenders are onto you." Rudy Gestede is getting a taste for this now. Following the corner which he won, the Villa man finds himself presented with another opportunity. But this team he is faced by a wall of white shirts who block his shot. Now there might be a blob of orange in the Spurs half on that Villa heatmap. Carles Gill pounces on sloppy play by Spurs midfielder Eric Dier, teeing up fellow Villa sub Rudy Gestede. But the lanky striker's shot is deflected over by Jan Vertonghen's sliding challenge. Plenty of red in attacking areas in Tottenham's heat map. Aston Villa's? Not so much. Christian Eriksen is very dangerous in these situations. Usually. The Dane winces as he bends the free-kick over the bar. Spurs' opening goalscorer Mousa Dembele is given a breather. The Belgian receives a standing ovation as he is replaced by Ryan Mason. Talk about rash! Villa left-back Kieran Richardson crunches into Erik Lamela close to the right byeline, earning himself a richly-deserved booking. Spurs cannot make Villa pay further though from the resulting free-kick. "Villa have no belief when they go forward. That's what Remi Garde has to change. When you are losing game after game it is so difficult." Villa do manage to win a corner - their first of the evening. The delivery is deep - too deep - as Ciaran Clark cannot reach the ball at the far post. The fourth official lofts up his electronic board to reveal that Jack Grealish's time is up. The young midfielder is, as you know, replaced by Carles Gil. Can he provide some magic? All smiles in the home stands as their side confidently knock the ball around in midfield. Nothing much to worry about, Villa posing little threat. "It is a monumental challenge for Aston Villa to stay up. They will have to do a Leicester. At least former Foxes boss Nigel Pearson had some fight in him. Does Remi Garde have that?" Danger averted. Aston Villa's wall stands as firm as concrete, blocking Christian Eriksen's curling effort. Villa's half-time substitute Rudy Gestede has not had much chance to cause a nuisance in the Spurs box. Instead, the bulky striker is helping out his team by carrying out some defensive duties around the halfway line. Well, a half chance. The away side win a free-kick about 25 yards and send the big fellas up from the back. Spurs stand firm to head clear Kieran Richardson's delivery, but only to Jack Grealish. The slick-haired Villa midfielder goes for goal but cannot find a gap through a wall of bodies with his low shot. You know what? I almost forgot Erik Lamela was playing before he linked up with Eric Dier a couple of moments ago. Now he is making more of an impression, teasing Kieran Richardson on the right edge of the Villa box before lobbing up a cross towards the far post. Danny Rose arrives from left-back to meet it but lacks a couple inches to keep his header down. Spurs beginning to find their rhythm again, building possession patiently from the back. Holding midfielder Eric Dier decides to drive forwards, playing a neat one-two with Erik Lamela, only to see his 18-yard shot smack into a claret and blue shirt. Not a vintage start from either side. The Spurs fans take great delight in seeing Villa's Scott Sinclair miscontrol into touch, not so much fun watching Danny Rose smash the ball wildly upfield. Ref Mike Dean does a quick head-count, looks at his watch and blows his whistle. We're rumbling. Gabby Agbonlahor only had eight touches in that first half, and he ain't going to get another. The Villa striker has been hooked at the break as the visitors introduce Rudy Gestede for a more physical presence up top. Wonder if Remi Garde is tempted to make a dash to Luton Airport and catch the next flight back to Lyon following that first-half performance? Former Aston Villa and Lyon boss Gerard Houllier says Garde, his former assistant at the French club, sought his advice ahead of the move. "He just wanted to know more about the club," said Houllier. "I said it was a great club, a great stadium, great training facilities and academy. As for the fan base, they support the team when they are not doing so well and I said he will have a chairman who will back him." This evening we've been asking you what you make of Remi Garde's appointment as Aston Villa manager. We gave you four options, with the most popular response being 'Remi who?' with 31% of the vote. You can see the full results at the top of the page. Here's how that second Spurs goal played out - Danny Rose's cross headed out to scorer Dele Alli by Villa's Joleon Lescott. They have now scored five times in the first half of their last two Premier League games. "Villa have offered nothing going forward and you can see confidence is very low. Once the first goal went in, they look like they gave up." Tottenham manager Mauricio Pochettino, however, must be pretty calm as he delivers his half-time team-talk. The home side flew out of the blocks, nabbed the early goal and were hardly threatened by the Villa attack. And a second strike at the opposite end of the half means Spurs are marching towards their 10th Premier League match without defeat. Villa cannot muster a response in the dying moments of the first half. Remi Garde might be tempted to go down to the away dressing room and throw a few expletives around. "Once again it comes down the left. Joleon Lescott heads it up in the air and Dele Alli is allowed time to hit it from the edge of the box. That's it now, game over for me. Good composure from the goalscorer." Spurs double their lead! The home side need just 17 seconds of the additional three minutes to leave Villa facing an uphill task. Dele Alli does the damage, neatly controlling Joleon Lescott's headed clearance, before drilling in from the edge of the box. Composed. Remi Garde shakes his head in the stands. Three minutes of added time. Can Spurs find another breakthrough? Or will Villa hang on? Roy Hodgson sees Jack Grealish give away a free-kick just outside the Villa area, then offer a bit of 'advice' to ref Mike Dean as he walks away. Dean has a quiet word in his ear. Christian Eriksen's free-kick bounces about the Villa box like a pinball, pinging of defenders. No penalty. This hasn't been a vintage half, and Aston Villa have struggled in possession. In fact, their passing success rate is the fourth lowest any team has had in a Premier League match this season. Ciaran Clark has been the biggest culprit of the visitors' outfield players, with just 36.4% of his passes reaching their intended target. The England manager is in attendance tonight at White Hart Lane, no doubt keeping an eye on the youthful midfield trio of Dele Alli, Eric Dier and Jack Grealish. Jordan Ayew has been on the pitch for two minutes - and he's already having his name taken by ref Mike Dean. The Ghana international is not quite up to the pace of the game, sliding late into Eric Dier and earning himself the game's first booking. Tottenham's goal came down their left - and that is where the majority of their play has been focused, with Harry Kane drifting wide, left-back Danny Rose marauding forward and Christian Eriksen and Mousa Dembele often finding themselves in that area of the field. Not too much Villa attacking in the Tottenham area so far. (Tottenham's heat map is below left, Villa's is below right). Jordan Ayew jogs out to the right flank, with Leandro Bacuna dropping inside to cover Ashley Westwood's absence. Ayew will need to roll up his sleeves and stop the Spurs onslaught down their left. The medics win. Ashley Westwood, Villa's most natural holding midfielder, is sensibly told he isn't fit enough to carry on. The more attack-minded Jordan Ayew trots on in his place. Ashley Westwood says he can carry on, the Villa doctors aren't too sure. Jordan Ayew is out to warm up. Play back under way. Worth pointing out that Dembele's stray arm into Westwood's face appeared to be accidental. But I'm not sure what has happened to the rule about stopping play when there is a head/facial injury. No blood streaming down Westwood's face, but there is a lengthy delay as he receives treatment. Hope the Villa medics have some smelling salts in their bag. I wouldn't fancy getting a flailing arm from Mousa Dembele in my chops. The Spurs midfielder is a bit of a brute. Unfortunately that is what happens to Ashley Westwood when the pair tangle in the Villa half. The Villa midfielder stays down but play continues. Ciaran Clark thumps out the ball at the next opportunity so his mate can receive treatment. All gone a little quiet in the last few minutes. Spurs fans find their voice as the hosts win a corner, Christian Eriksen's delivery headed clear by Alan Hutton from inside his own six-yard box. Scott Sinclair is justifying his selection* in my fantasy football team - he is providing Villa's brightest attacking spark. Sinclair gamely chases a ball forward, but Hugo Lloris is alert to come off his line and block. "Was Harry Kane a bit selfish there? Well, he got his goals against Bournemouth and will fancy his chances. Tottenham have realised there are goals in this game if they keep doing the right things." Tottenham are smelling blood. Harry Kane makes a run down the left channel, cutting inside Ciaran Clark to force Brad Guzan into a fingertip save with a rising drive. Then, from the resulting corner, the away team are caught out by a training-ground set-piece move as Danny Rose peels off to blast just over the crossbar. Tottenham are dominating possession but, perhaps a little surprisingly, Aston Villa have had the edge territorially. Alan Hutton - what are you doing?! The Aston Villa right-back dummies the ball about 25 yards from his own goal after Joelon Lescott's pass out of defence. Wowzers. It leaves Leandro Bacuna facing a hospital pass - almost literally. The Villa midfielder is crunched by Spurs left-back Danny Rose, but the Dutchman has a soak of the magic sponge and gingerly gets to his feet. The Sweeper Keeper: The future of England's midfield on display here in Dier, Alli and Grealish? Could have a nice balance to it. Villa look pretty content to sit back, defending in almost a 4-6-0 formation with lone striker Gabby Agbonlahor dropping in alongside his midfielders. Spurs playing patiently, yet to create another clearcut opening following the goal. "Tottenham's only problem in this game now is complacency." Villa's problems have stemmed from a chronic lack of goals and a lack of numbers in the Spurs box means they fail to take advantage of Alan Hutton's curling cross from the right. Not a single claret and blue shirt attacks the six-yard box, leaving the Scot waving his hand up in the air in frustration. Chris Baldwin: Paul Gascoigne was manager of Kettering for 6 weeks? I love Gazza but that was never going to end well. But there is an edginess to the Villa backline after conceding that early goal. Joleon Lescott is being hounded by Harry Kane, the Villa man hoping keeper Brad Guzan will come out to collect. Eventually the American does and both Villa men breathe a sigh of relief. Here's another look at how Mousa Dembele scored that goal. It was the third fastest in the top flight this season (only Matt Ritchie 00:49 and James Milner 01:06 have been quicker). Villa haven't been that shambolic at the back this season - well, judging by the number of goals they have conceded anyway. But they almost shoot themselves in the foot when Joleon Lescott smashes into the back of his centre-back partner Ciaran Clark. Luckily Spurs cannot pounce on the loose ball and Villa boot clear. "Great play by Scott Sinclair, he almost hit it too well. A bit of slice or curl and he would have beaten Hugo Lloris." This is more like it Villa! Signs of encouragement for the fed-up away fans as Scott Sinclair stings the palms of Spurs keeper Hugo Lloris. The Villa winger cuts in from the left touchline, scampering between two flimsy home challenges, before shooting towards the near post. But Lloris is alert to gather after initially palming down. Tottenham midfielder Dele Alli is shoved to the floor by Carlos Sanchez, but Spurs cannot make the set-piece count. Jon Evans: Guzan should save that. Whilst Clark's error was key, any decent keeper should stop that. Straight at him. His form is poor! Matthew Bevis: You could tell Mike Dean was proper chuffed with himself for that advantage there they way he ran off after the goal! Mike Dean allowed Mousa Dembele to carry on despite Ciaran Clark doing his best to wrestle the Spurs man to the ground. Aston Villa are still on the backfoot. Jan Vertonghen pops up in the Spurs attack but Joleon Lescott manages to clear the danger with his head. Villa break briefly through Kieran Richardson down the left, but cannot fashion a chance. "Simply poor defending, it's Ciaran Clark, he just gets pushed out of the way by Mousa Dembele, who is not particularly quick. Brad Guzan possibly should do better. Individual errors, really. I bet Remi Garde wishes he was still in traffic!" Oh dear - Remi Garde looks speechless. Nightmare start for Villa, perfect for Spurs. Mousa Dembele barges Ciaran Clark out of the way in the left channel, using his strength to hold him off, then carries on into the box and fires through Brad Guzan's legs. Spurs on the front foot quite quickly, forcing Villa centre-back Joleon Lescott to kick into touch. But they cannot make anything of the throw-in, away keeper Brad Guzan clearing with his feet. Routine start. Spurs to kick off. Ref Mike Dean toots his whistle for the first time this evening and that, unless I'm very much mistaken, means it is game on. Tottenham Hotspur: Lloris, Walker, Alderweireld, Vertonghen, Rose, Dier, Alli, Lamela, Dembele, Eriksen, Kane. Subs: Mason, Vorm, Trippier, Townsend, Fazio, Onomah, Davies. Aston Villa: Guzan, Hutton, Clark, Lescott, Richardson, Sanchez, Westwood, Bacuna, Grealish, Sinclair, Agbonlahor. Subs: Veretout, Ayew, Amavi, Gil, Bunn, Crespo, Gestede. If I could use a 'clapping hands' emoji right now I would. Sensational fact. Remi Garde is in the house! The new Villa boss takes his seat in the White Hart Lane stand. Arms folded, stern expression, then an inquisitive look along his row. Hope he's got a notepad and pen to make a few notes. "Neither Tottenham nor Aston Villa gave Tim Sherwood a full season to prove his worth. He had exactly 28 games at both clubs before each gave him the bullet. "His influence still lingers over this fixture though. Harry Kane and Jack Grealish were given their first starts in the Premier League under Sherwood's tutelage. Those young guns alone weren't able to keep him in employment. "With Remi Garde ready to roll up his sleeves, Villa need fresh ammunition for the tough winter months ahead. "Ultimately Sherwood, in his trademark gilet, proved to be a couple of sleeves short of the full metal jacket." Former Aston Villa and Lyon boss Gerard Houllier on Remi Garde: "The good thing is that he was a TV pundit in France for the Premier League and as he played in the Premier League himself. He was always following the news on the players there. At the moment, let's not dream, I would say escaping relegation would be as good for winning the title." Football often throws up quirks - and here's another. Harry Kane had scored a hatful of goals for Spurs in the Europa League last season, but did not net in the Premier League until the early part of the winter. On 2 November to be precise. On 2 November against Aston Villa. Kane calls that the "defining moment" of his breakthrough season. Deja vu for Aston Villa tonight? "One season wonder!" cried the nay-sayers. Harry Kane has been struggling with second-season syndrome for Spurs, leading to some people (mainly non-Spurs fans) to question whether the England striker is actually all that. But he returned to form at Bournemouth last weekend, bagging a hat-trick in the 5-1 win. Kane had eight touches in the Bournemouth penalty area - scoring with three of them.Image caption: Kane had eight touches in the Bournemouth penalty area - scoring with three of them. Vishnu Ladwa: How about Felix Magath at Fulham or Pepe Mel at West Brom? Matthew Murray: Dr Josef Venglos in the 90s for Villa, never turned out well at all that. Aston Villa boss Kevin MacDonald on Micah Richards' ban: "We always knew that something might happen, so we put a couple of things in place, and if it was for two games we probably would have appealed." As it was, Villa accepted Richards' ban for one game only. Villa to stop the rot? "Football is always in the present and we need to show tonight why we are unbeaten. We never think in the past, we live in the present. Football is present, present, present. It is true that we have momentum, but tonight we have a difficult opponent. "We always need to stay motivated and try to win every game. It is about us, our mentality and not the opponent." Spurs stuck five past Bournemouth last weekend - the perfect result going into a busy week. Because tonight's match is the first of three matches inside seven days for Mauricio Pochettino's men. Leon Bradley: At the time the appointment of our physio @TheNigelAdkins for @SUFCOfficial seemed a strange one!! Rizpey: Chris Ramsey here at QPR. NO experiance at all. Gets relegated then gets full time job, what? Tottenham midfielder Dele Alli talking to Sky Sports: "We're playing really well and confidence is growing as we keep the undefeated record going. Hopefully we can carry that on today." On a possible 'new manager effect' for Villa: "It doesn't have an effect on us, we have got to go out there and play as well as we can - like we have been. We will go out there and try to play our best football." "Why are you banging on about Aston Villa?!" I hear Spurs fans cry. "What about us???" Forgive me. In short, Spurs are trundling along very nicely. Since losing to Manchester United on the opening weekend, Spurs are unbeaten in the Premier League. Four wins and five draws mean they have slightly gone under the radar. But three points tonight will stick them in the top five and hot on the heels of fourth-placed Manchester United. Has your club made a stranger appointment? And did they bomb, or actually manage to do a decent job? Let us know. Villa caretaker boss Kevin MacDonald on Sky Sports on his contact with Remi Garde: "I've not spoken to him, he sent me a text and hopefully he will get here on time to watch the game, but I understand that there have been problems with the plane. "I've picked the side, and brought in a few players from the under-21s. It's up to Remi whether he wants to be involved tonight. He might see something up in the stands and want to change it." Lost in the fog is not a metaphor for Aston Villa's current plight. Nope, it is a literal description of Remi Garde's day. The new Villa manager was scheduled to arrive in Birmingham about lunchtime, but his flight from Lyon was delayed by the mist across England. So instead he had to sit around in the departure lounge for a little spell before boarding a plane to Luton instead. Bet he spent a packet in the duty-free shop to pass the time. Garde's only major honour as a manager arrived in 2012, when he guided Lyon to the French Cup. He left Lyon at the end of the 2013-14 season for personal reasons. Charles Martland: Strangest ever managerial appointment: Claude Anelka at Raith Rovers (2004). No experience, 8 games, 1 point and a resignation. Richard M Evans: Dean Saunders, Terry Connor, Stale Solbakken all Wolves inside 12 months. The Spurs boys are all smiles as they walk into a slightly misty White Hart Lane. Plunging temperatures in the capital see Harry Kane and Hugo Lloris wearing warming gilets. Maybe they were left behind in Tim Sherwood's old office at the Lane. Tottenham are unchanged following their 5-1 win over Bournemouth, with Harry Kane leading the line fresh from his hat-trick in that game. Villa caretaker boss Kevin MacDonald makes three changes to the team which lost to Southampton in the Capital One Cup last Wednesday. Joleon Lescott returns from injury to take his place in defence, while Jack Grealish and Scott Sinclair are back in to make up a five-man midfield. Team news is just breaking from White Hart Lane - and there is no Micah Richards in the Villa starting XI. That's because their captain has been banned for one game after an incident in the tunnel after defeat by Swansea. A decision announced, in fact, about 20 minutes ago. "Garde will be expected to get more out of the more inexperienced French speaking players. The feeling still remains though that these players actually might not be good enough. But it has got us thinking about other bizarre managerial appointments. What is your club's strangest choice? And did it work? Tell us using #bbcfootball on Twitter or by texting 81111. What are you waiting for? So what do you make of the news that Aston Villa have appointed Remi Garde as their new manager? Let us know by voting at the top of the page. The vote will close at half-time and terms and conditions can be found here. Well done! Of course you all correctly guessed Patrick Vieira and Remi Garde. You know-it-alls. Garde, not Vieira, has gone from Premier League quiz question to Premier League manager, after being appointed a few hours ago as the new 'saviour' of Aston Villa. The Frenchman will not take charge of tonight's trip to Tottenham though, instead sitting in the stands as caretaker boss Kevin MacDonald oversees operations. All fans of the beautiful game love a tricky football quiz question. The chance to delve into the bottom of your brain and pluck out an obscure answer is too good to miss. To impress work-mates, maybe to woo a romantic interest. And, above all else, to try and stop that self-satisfying smirk to yourself when you've nailed it.